Yaowarat, or Bangkok’s Chinatown, is one of the most exciting and busiest parts of the city. 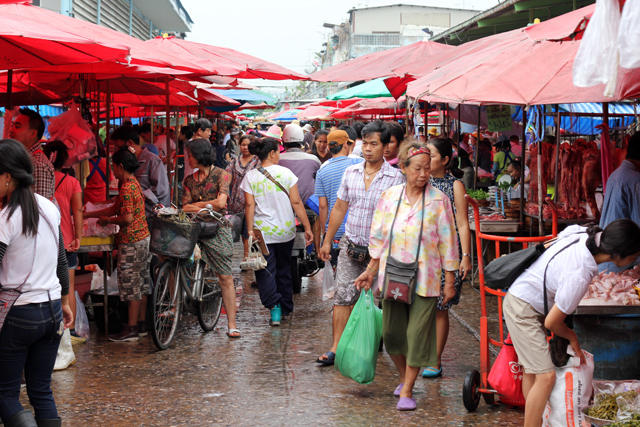 Along with a fantastic array of Thai street food, there are a number of shopping markets. The most famous is Sampeng Market, a seemingly everlasting sprawl of random trinkets, latest inventions, jewelry, fabric and everything else you can imagine. The market is often jam packed with shoppers, street food carts and transport dollies all scurrying through the narrow aisles. Sampeng Market is a place where many store owners or market stall vendors in other parts of the city purchase wholesale deals. Easily the most world famous shopping market in Bangkok is the weekend Chatuchak Market – a massive jumble of stalls and permanent stores for the extreme shopaholics. Everything is available at Chatuchak Market… that is if you know where to look! I’ve spent hours wandering around, looking for something I had seen on a previous visit and had no idea where to ever find it again – it’s that BIG (Hint: if you see a stall you really like, take note of its stall number location so you can come back). As a very local style Bangkok night market, Saphan Phut doesn’t get too much attention form visiting tourists. However, if you’re interested in seeing the latest local trends or observing the modern youth culture of Thailand, Saphan Phut is a great place to see. While a lot of the clothing and accessories caters towards youth, there’s still a lot of random stalls (and always changing stalls) to be discovered. You may stumble into a vintage rock band t-shirt collection or an army fatigue clothing stand. Be sure to sample the fried squid eggs, particularly famous at Saphan Phut! Conveniently located in one of Bangkok’s most happening districts, Pratunam market is among the most thriving shopping markets in Bangkok. The market deals mostly clothing but there’s also a mishmash of other things like Thai souvenirs. As a wholesale market, it’s not uncommon to see many foreigners from around the world buying in bulk to bring things back to sell in their home countries. Pratunam makes a great home-base when you’re visiting Bangkok if you’re into shopping. There are plenty of accommodation choices in Pratunam, and even some hotels like a Novotel directly above Platinum. If you’ve had enough winding through the alleys you can always step into the craziness of Platinum Shopping Center, purchase electronics at Pantip Plaza, or even make the short walk to the modern CentralWorld mall. One of Bangkok’s biggest and busiest fresh food markets is Khlong Toey. No matter if you’re looking to buy some fresh fruit or supply an entire restaurant with all necessary ingredients, you can purchase everything at this sprawling market. Amidst the backdrop of modern flashy buildings and sky-rises, butchers slice fresh cuts of meat and vegetables are sold by the bushel. The market is one of the food distribution hubs of Bangkok, so there’s always plenty of energy and lots to observe. Walking around Khlong Toey is a very interesting and insightful experience in Bangkok. Located across the Chao Phraya River from Bangkok’s Grand Palace and adjacent to Siriraj Hospital, eating and browsing through Wang Lang is one of my favorite things to do in Bangkok.